Here at Cadillac Window Fashions we know that choosing the right window coverings for your home or office can be a daunting task. There are a lot of options to choose from and shutters are a great option. They are low maintenance, weather resistant and are quick and easy to install. They give a clean look to any room they are in. The most well-known, California Shutters, are able to be opened like a door which really lets in the fresh air and fills any room with natural light. 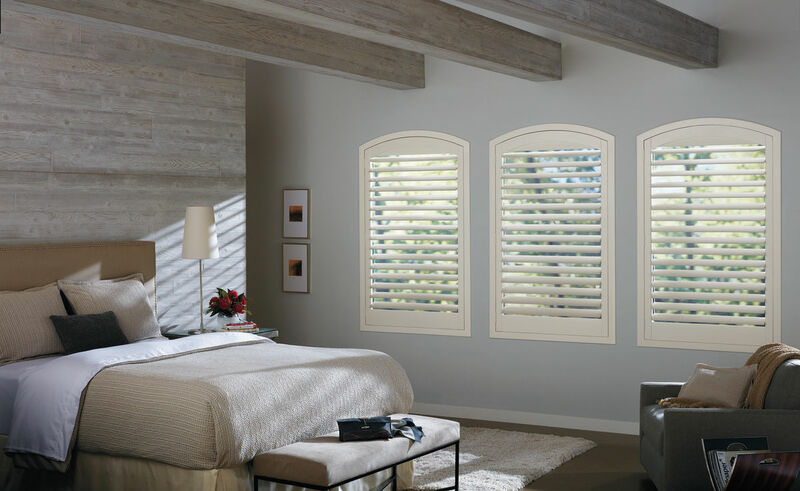 At Cadillac Window Fashions we have been manufacturing custom California shutters for over 30 years. Our shutters are specially made to not fade over time and they are scratch resistant. Are you tired of replacing the flimsy metal blinds in your home? Do the strings that hang down from them break, get knotted or just get in the way? Shutters are a solid solution; they are made out of solid and sturdy materials. They have no strings or chains to worry about breaking. You do not have fabric lying on the floor to get stepped on or torn by your pets like you do with curtains. All the pieces to shutters are connected so you have no loose dangling parts that you have to worry about. Since shutters are made from thick and hard surfaces they are an ideal solution for a low maintenance window cover. They have a large and easy to clean surface area which can easily be dusted off with a soft dry cloth. No soap is required. When cleaning wooden shutters keep in mind to not use water on them as it they may get damaged. If you feel like they can use a little shining up, you can even use some furniture polish on them. Since we have been in business for over 30 years, one thing we can attest to is that shutters never go out of style. They have been around and firmly entrenched in interior design for decades and don’t show any signs of disappearing. They are built strong so they will last you long. You get more control over the amount of natural light in the room. Shutters can be easily tilted up or down for different angles of light. You will no longer have to worry about the sun in your eyes. The wider slats on California Shutters make them ideal to help create a modern look and feel for your room. Shutters are very easy to install and they can even increase the value of your home. When it comes to deciding what covers to use for your glass doors, shutters are a great alternative to the traditional curtain or blinds. They are a durable and stylish option for your door décor. They are offered in a variety of different styles, materials, and colors to enhance the interior design of your home or office. Whether you have a glass door that slides open or a more traditional door, California Shutters can work for you. Your home privacy is never a problem with shutters. The thick material makes sure that they are not transparent. You just flip them closed and no one will be able to see inside your home. One thing that might not come to your mind when choosing window covers is that they will help with your energy bill. Using shutters can save you money. In the hot summer months, they will not let the hot sunlight heat up your home while keeping the cool air in. Keeping the shutters closed will create a UV protection. In the winter they can even help the cold air draft that happens with older windows. In a nut shell shutters will help lower your energy bill. For over 30 years Cadillac Window Fashions has been servicing homes and offices in Toronto, Mississauga, Brampton, Scarborough and throughout the GTA. We continue to make happy customers across Southern Ontario. Our shutters can be custom crafted to fit the style you are looking for. They are available in various sizes, colors and finishes. All of our shutters come with our full satisfaction warranty.